As part of his Fish Fight, Hugh Fearnley-Whittingstall is encouraging us to eat a more diverse range of fish, and there’s one cheap, sustainable, nutritious and extremely tasty species right at the front of the pack. Criminally under-valued, mackerel is nothing short of a show-stopper. Packed with all the right types of fish oil and minerals, it’s plentiful in British waters, easy to catch and it’s quality belies the meager price you’ll pay for it. Hugh’s big idea is to get mackerel on the menu at the local fish and chip shop, next to cod and haddock. Maybe it could just supplant the major disappointment that is plaice or the abomination of the battered sausage? In the affection of the chip shop frequenting British public (that’s all of us, non-Brits), cod and haddock reign supreme, with only minor regional swings between the two giants of the white fish world. In West Yorkshire, it’s haddock all the way, skinned, please. This might be Hugh’s biggest problem. When we think of fish and chips, we think of a big piece of white fish. Anything else, and I feel cheated. But setting that aside, what about mackerel? I decided to have a go myself. Hugh’s recipe is so simple it isn’t really a recipe, more of a method – dust an un-skinned, pin boned mackerel fillet in seasoned flour, dip it thoroughly in beaten egg and then deep fry for just a couple of minutes until the fillet turns golden and floats to the top of the oil. Drain the oil from the fillet and serve in a floury bap with tartare sauce, or at a pinch, some mayonnaise perked up with a little lemon juice. Yes, it’s incredible. Mackerel has a depth of flavour that’s missing from most white fish, it’s a gutsy contender whose taste isn’t swamped by the light-as-air-almost-batter that Hugh recommends. The combination of sweet, oily mackerel and light, floury bread is a complete revelation. Would I buy it from a fish and chip shop? Yes, I think I probably would. The proof is in the eating, and I’m a convert. This is a recipe that’s definitely best cooked by a proper fish and chip shop – if you want to try it, ask your local fish and chip shop to give it a try and add it to their menu. I must point out that neither of those people are me, although I do aspire to sideburns as good as the ones on display in the film. 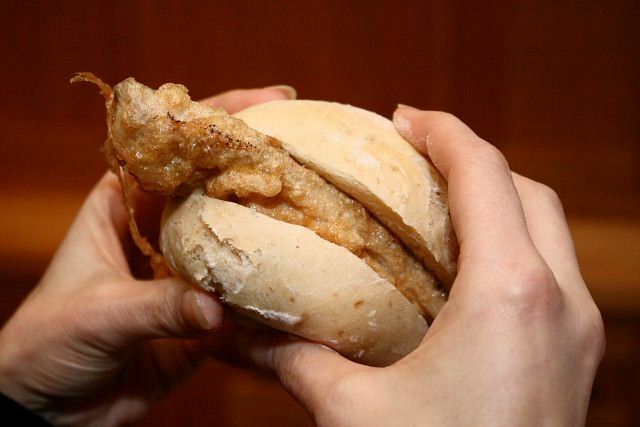 Great blog as usual, but be very, VERY, careful how you talk about the battered sausage! Oh, come on David…nobody really likes battered sausages. Holy mackerel, Batman! I have a hankering for a fish sandwich. I agree that mackerel is a worthy contender in the white fish world where cod and haddock rule supreme. I particularly appreciate its sustainability. Your descriptive of the fish paired with the bread had me. Thank you for posting this simple, tangible recipe! Oh great, I've never had mackerel and that sandwich looks so freakin' good! The MackBap will definitley be replacing the Saturday lunch time fish finger sandwhich in our household from now on! I can eat it guilt free. Some great mackerel to be had from the fishmongers in Leeds Kirkgate Market, huge juicy and meaty. I might have to ask my local chippy if they'll deep fry me one, think I might get a funny look though! Sorry to rain on your parade but mackerel sandwiches have been eaten in Istanbul for much, much longer. Not battered, I grant you, but all the better for that. Usually caught the same day, split in two, grilled and slapped between half a Turkish ‘baguette’ and served with salad on the edge of the Bosphorous. All for about £1. A not-very-distinct picture at http://room806.tumblr.com/post/466105495/turkish-fish-sandwich where you’ll also find other food photos. Why are perfectly good fish thrown back into the sea, dead?